Meet your new favorite tote bag! Pick a color and we’ll embroider with a name for no extra cost! This embroidery will be done in your choice of our 20 thread colors. 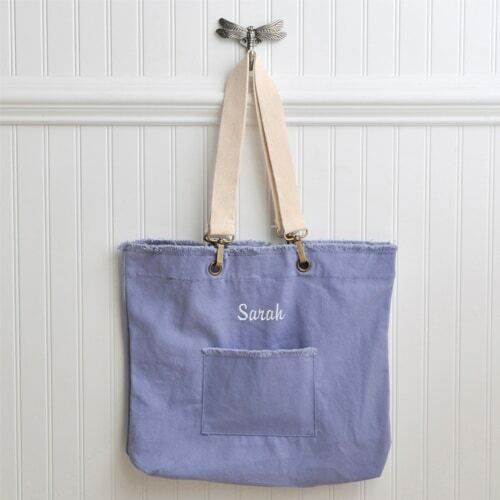 Our Pretty Pastel Personalized Tote Bags are great gift for bridesmaids, moms and girlfriends. The bags are available in pink, green, khaki and slate. They include plenty of room to tuck away gear for a trip to the beach or gym. The comfortable double strap makes it easy to carry on the shoulder and the outside pocket is ideal for storing a cell phone or set of keys. Use this bag on the wedding day and beyond! Available in pink, green, khaki and slate colors.